The Aprilia RST1000 Futura is fitted with a pair of radiators, one each side of the bike, linked by a pipe across the top. 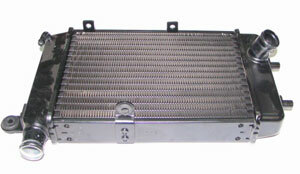 Radiators are common to all the 2000 RSV Mille-derived bikes, including the Falco and Caponord. You don’t need a Futura replacement part – just a left or a right one. Also see information on topping up the coolant. Of course, crash bungs and even panniers go a long way towards protecting the radiators in a spill.